You know when you’re hungry and eggs sounds like the perfect meal, and you’re laying in bed thinking, What kind of pan can I cook them in that won’t kill me slowly? And secondly, Which pan will leave me with delicious eggs, sans crispy terror of egg residue that I’ll have to scrub for days? Mmmm, easy like Sunday morning. Maybe you've found yourself in this predicament before. Many of you are probably aware that nonstick cookware isn't healthy. Maybe you’re already in the cast iron club or forever loyal to your stainless steel arsenal, but there might be a few things you don’t yet know. Today’s post is all about healthy cookware. We’ll start with the worst. There’s nothing like cooking an egg and having absolutely no evidence left behind in your pan. Convenience is important to us these days, clearly. But like many things that seem too good to be true, non-stick pans are just that. Teflon is a Dupont trademark used to coat your pans so that food won’t stick to them. It’s a synthetic polymer called polytetrafluoroethylene, or PTFE, and it’s not good for you. Inert in a solid state, Teflon pieces that flake off from your non-stick cookware aren’t what’s causing you the most harm—it’s the fumes. 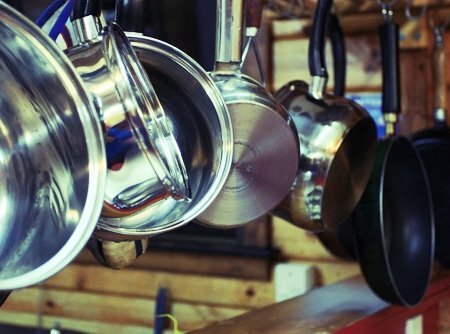 Manufacturers warn not to use high heat when cooking with Teflon, but a study conducted in 2003, commissioned by EWG showed that a mere 2-5 minutes of stovetop heating brought Teflon pans to temperatures above the limit at which they start to emit toxic particles and gas, believed to be 554°F. How toxic? If you’re a bird, extremely. Fumes from an overheated non-stick pan can kill birds in seconds. Humans are said to develop flu-like symptoms, described as Polymer fume fever or “Teflon Flu.” Not good. If Teflon pans are non-optional in your kitchen, consider using the lowest temperature possible to cook your food, or only using them for eggs, pancakes, or other foods where sticking is particularly problematic. Ideally, you'll want to upgrade to one of these healthier options. If perfectly browned food is your wish, this is your pan of choice. Beyond being a favorite of chefs, stainless steel is considered one of the safest cookware options. So-called stainless because it doesn’t rust, stainless steel also doesn’t conduct well, so these pans are made by sandwiching other metals, usually nickel and chromium in between a steel exterior. Any stainless steel pan you buy is going to be made of at least 10% chromium. The numbers on the bottom tell you more. If it reads 18/10, that means there’s 18% chromium and 10% nickel. Cookware labeled 18/10 or 18/8 is part of the 300 series and is the most common type you’ll see. Nickel is known to be the most prone to leaching, so although cookware that is 18/0, known as the 400 series, is the most vulnerable to corrosion, it’s also considered the safest due to it containing the least amount of nickel. Scratching your stainless steel pan increases the likelihood of exposure to the mixture of metals inside, but in general leaching is relatively minimal. It’s good to be aware of your sensitivities, though—those with nickel allergies may need to avoid stainless steel altogether. And since we’re egg-themed today, click here for a video of Hannah from Wild Mint Shop demonstrating how to cook an egg in a stainless steel pan without making a mess. There are a lot of cast iron devotees out there. And it’s for a good reason. Instead of leaching chemicals into your food, cast iron leaches iron, something that many of us could use more of. A 2003 review of current research by the Journal of Human Nutrition and Dietetics reported that cast iron may be helpful for reducing iron deficiency. Cast iron is an alloy of iron that contains 2-4% carbon, varying amounts of silicon and manganese, and occasionally trace impurities like sulfur and phosphorus. The metal has been made and used as far back as the 6th century. As a cookware, it has withstood the test of time due to its durability and functionality. And because it's so durable, cast iron pans can be purchased second hand. Simply wash and reseason your hand-me-down pan and it's good to go. Some people swear by cast iron’s ability to heat up evenly, but Serious Eats actually refutes this theory. They explain that cast iron’s conductivity is actually poor, so the part of the pan directly above the flame gets significantly hotter than the surrounding metal. According to them, cast iron’s bragging rights lies in its exceptional emissivity and high volumetric heat capacity. Its emissivity describes how much the heat emits from the surface out. You’ll notice that when your hand is above a stainless steel pan, which has low emissivity (.07), you won’t feel the heat. On the contrary, cast iron emits heat further (emissivity=.64) and thus cooks beyond what’s directly touching the hot surface. So when you're piling ingredients into your pan and wanting to cook evenly from top to bottom, cast iron is your pan of choice. Its high volumetric heat capacity means that once it gets hot, it stays hot. Most people who have used cast iron can attest to this. So considering all of these characteristics, you want to make sure you heat your pan thoroughly before putting food in, turning the pan to make sure all parts of it heat. And don’t crank the burner past the heat you want, because the cool down will take some time. We won’t even touch the controversial subject of how to clean a cast iron pan. All we’ll say is that we fully support cast iron in the kitchen. Though there are several more options out there, we’ll end with ceramic. Recommended by Wellness Mama, ceramic cookware is generally thought of as safe. This is cookware that is made from clay, then fired in order to render stable and durable items. A properly glazed piece should not leach metals into your food, metals in this case being silicon and aluminum (typically found in clay) or impurities such as arsenic. Heavy metals cadmium and lead are sometimes used to glaze pots, so this is something you want to watch out for when purchasing. Color-glazed pots may also have metals in their pigment. Look for pots from reputable sources that state that their glaze is free of toxic pigments and heavy metals. To make glass ceramic cookware you start by making glass. Glass can be made from different materials, including sand, gypsum, soda ash, limestone, or dolomite. In these mixtures you’ll find various minerals such as calcium, magnesium, sulfur, sodium, carbon, and silicon. Again, the heat processing here, called vitrification, is needed in order to achieve the inertness that allows you to heat the final product without ingesting silicon or other harmful substances. A second heating process turns the glass into ceramic. Compared to traditional clay ceramic, glass ceramic is less porous and higher in strength. Porcelain enamel cookware is made by taking porcelain and melting it onto another metal like cast iron, aluminum, or stainless steel. When chipped, these metals can affect your food, so you may want to opt for cast iron (which will be heavier) or stainless steel. If it’s not chipped, though, most enameled porcelain is safe and recommended! What’s your preferred type of cookware? Wellness Mama – Are Glazed Ceramic Pans Safe? Mother Nature Network – What’s the Safest Cookware?